The endoscopic resection of colorectal polyps that are limited to the mucosa is a well established procedure. Nevertheless, modern imaging technology and screening programs have increased the detection of benign but large (> 20 mm) polyps. In flat laterally spreading tumors (LST), especially the nongranular (NG) type, the rate of submucosal invasion is found to be as high as 39 % (34 % – 44 %) . For this reason a resection in one piece is mandatory . We report on the resection of a 25-mm flat rectal LST-NG in a 60-year-old patient who was admitted to the Klinikum Augsburg after screening colonoscopy ([Fig. 1]). Examination with a high definition colonoscope (CF-HQ 190I; Olympus Medical Systems, Tokyo, Japan) demonstrated a Sano Type II, pit pattern IIIs lesion. Fig. 1 Rectal laterally spreading tumor – nongranular type. a The tumor during screening colonoscopy. b Narrow-band imaging with a high definition colonoscope demonstrated a Sano Type II lesion. c After spray application of indigo carmine solution, a surface pit pattern IIIs was diagnosed. We decided to use two newly developed devices, the Flat Adenoma Resection Instruments (Endox-Feinmechanik GmbH, Bad Urach, Germany). Submucosal injection was performed using a mixture of saline, epinephrine (1 : 100 000), glycerol (10 %), and a small amount of indigo carmine solution. Circumferential incision was performed using the FARIn Type I, a rhomboid-shaped device with a small 1-mm cutting tooth at the distal tip. A high frequency generator (VIO 300 D; Erbe, Tübingen, Germany) was configured to AUTO CUT 300 W and FORCED COAG 30 W. After circumferential incision, the specimen could be resected en bloc using the FARIn Type C, a symmetric snare with a cutting wire length of 15 mm ([Fig. 2], [Video 1]). Fig. 2 Resection of the rectal tumor using the Flat Adenoma Resection Instruments (FARIn; Endox-Feinmechanik GmbH, Bad Urach, Germany). 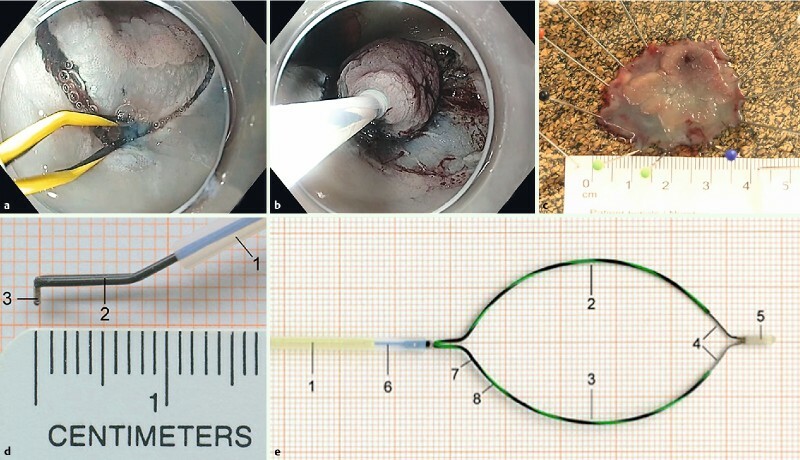 a, d Hybrid endoscopic submucosal dissection using the FARIn Type I: 1 = catheter sheath; 2 = the rhomboid-shaped and electrically isolated section; 3 = the 1-mm tooth at the distal end, used for circular incision (a). b, e The specimen could be resected using the partially insulated snare (FARIn Type C): 1 = catheter sheath; 2, 3 = electrically isolated section of the device; 4 = the 15-mm cutting wire at the distal tip of the snare; 5 = the tip of the snare is isolated in order to protect the organ wall from injury; 7, 8 = The colored markings on the snare allow the cutting speed to be visualized when the snare is closed. c Resected specimen mounted onto cork, showing the adenoma in the center of the mucosa. Partially insulated instruments for hybrid endoscopic submucosal dissection of a rectal laterally spreading tumor–nongranular type. 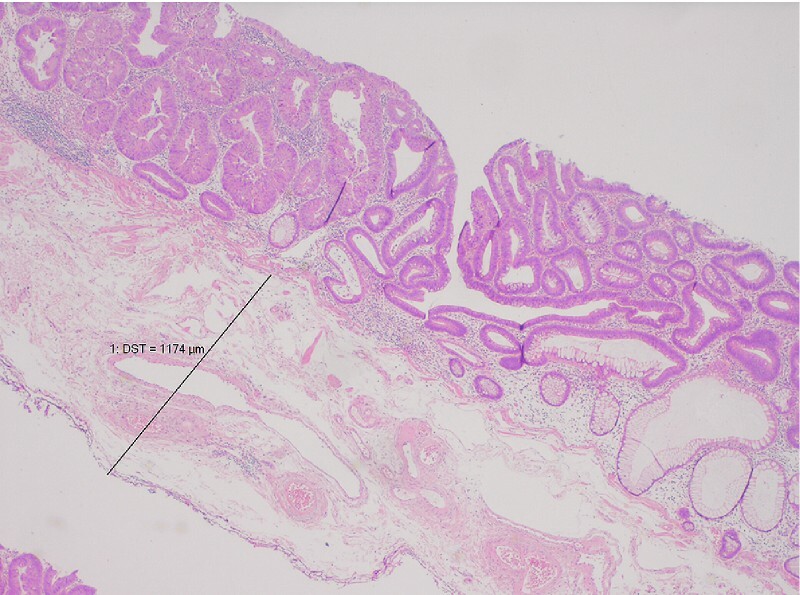 The histopathological examination showed an adenoma with high grade dysplasia, and an adherent submucosal layer to a depth of > 1000 µm under the entire lesion ([Fig. 3]). Fig. 3 The histopathological examination showed an adenoma with high grade dysplasia in the center of the lesion and an adherent submucosal layer of > 1000 µm in depth (DST). Complete (R0) circumferential resection of the lesion was achieved (hematoxylin and eosin × 20). In summary, the FARIn instruments allowed the en bloc resection of a large (> 20 mm) LST-NG with adherent submucosal layer (> 1000 µm), which meets the specimen requirements for pathological complete resection (R0). Competing interests: Dr. Farin is the inventor of the FARIn devices.